As a High School Technology Applications teacher, I have had the fortunate opportunity to experience the usage of a wide range of technological resources in my classes, yet at the same time, with my Social Studies background, I am able to relate the usage of many of the resources I use to core curriculum and the use in a more traditional classroom environment. Listed here is a detailed list of the different types of resources I have used or am familiar with in my classroom. Most people are familiar with the Microsoft Office suite, but I thought it would still be important to list anyway. Three big programs I have used in Office are Word, Excel, and Powerpoint. Generally, I use Word and Excel to create new worksheets or handouts of information, and PDF versions of tutorials that I share with my students. One great way to use is Excel is tracking information, especially for RTI. Every time I make a parent contact, send out an assignment to in school suspension, or refer a student to his or her administrator, I document the event in an Excel Worksheet. I keep three worksheets in the file: a.) parent contact, b:) assignments sent to OCS, and c:) Written Referrals. This makes it easy to keep up with my information on my network space and easy to email to my administrator when they ask for my documentation. At the conclusion of the school year, I zip the file along with any other documents saved pertaining to that year and archive them for four years. I have found Adobe Acrobat Pro to be an extremely useful program for teachers, especially in the last two years. Acrobat not only allows me to develop PDF files, but it also allows me to create forms, distribute them, and recall the results, automatically storing them in a spreadsheet, (very similar to Google forms.) I have also used Acrobat to develop a portfolio of information, where an entire package of information is essentially stored in one document, making it easier to distribute to colleagues on a committee, students, etc. With Acrobat, I have also assembled multiple files into one PDF file, such as a Student Handbook, or attaching assignments to an assignment sheet, or a PDF of an email as an addendum to some sort of report. There are several PDF programs out there and Google has really caught up, but I still find myself partial to Adobe Acrobat Pro! In addition to Acrobat, the Adobe Creative Suite has been such a blast to work with for my students! When I first started my current teaching position, the software package we had was Macromedia 8, which included Flash, Dreamweaver, and Fireworks. While many people were using Flash and Dreamweaver, they were using the Adobe buyout versions that were newer, and we did not have access to a full version of Photoshop, making it difficult to find supplemental materials online to share with my students. Using the CS5 suite has made the search for materials online so much easier! Now I can easily access a multitude of tutorials pre-written online, allowing me to spend more time customizing material for my students, increasing my knowledge of the programs, and developing new curriculum for my department. Other programs I am familiar with are supplemental and a lot of times deal with personal preference or depends on what project I am using. Firefox, First Class, FastStone Capture, Windows Movie Maker, Audacity, Chrome all are well versed in my knowledge bank. Moodle & Edmodo: Much like Blackboard, Moodle is an online classroom environment that is often adopted by schools and hosted on their own servers. Currently I use Moodle with my classes to upload resources such as tutorials, assignments, links to web pages, etc. Teachers can use the environment to have turn in boxes for each assignment and issue grades, create journal activities, along with forums. There is also the option for blogging as well as a test or quiz bank, but I am more likely to have my students answer their questions in a journal format or do a form. I have really liked the reaction I have seen from my students to the online forums. This resource allows students to share their work and critique each other, as well as have discussions regarding certain topics. Recently we did a lesson about QR codes, and at the end of the lesson, students were required to do independent research and then enter their discussion topic on the forum explaining ideas they had of how QR codes can be used in education as well as other industries, then the students had to reply to at least two other discussions in the forum made by their classmates. Edmodo is a great new online course resource that I plan to fully implement in my classes next year! Already used by educators across the country in a variety of age groups, Edmodo allows teachers to host an online environment for students much like Moodle, and connect to other educators and teachers for collaboration. I like to think of it as an educational form of Facebook, and the interface is very similar as well, so it’s extremely easy to use for our students, and there is a mobile app to boot! Now students can have the option of staying in touch from their smart phone or tablet! Currently, I have two favorite resources that I use in conjunction with my online learning environment: Gmail and Pinterest. Both of these are newly implemented into my classroom this year and I have seen a definite increase in student engagement because of it. During the very beginning of the school year, I spend time encouraging my students to sign up for a Gmail account and if they email me with it, I give them extra credit. Then I can add their email address to my contacts and it establishes a connection between me and my students. There have been several times throughout the course of the year where students have emailed me regarding questions about classwork, technical problems they are having if I happen to be out for the day, or sometimes they just email me because they want to tell me something that they did not want to say in front of the rest of the class or in person. It has really been a great tool to use with my students and has opened up communication with them! They feel much more comfortable communicating with me through my Gmail rather than my ISD address. One thing I would advise though for transparency, discuss this with your supervisor first, and make it known that you are using Gmail communication with your students and allow them to have the address as well, as to hopefully remove any doubt of ill will. Pinterest. I would have to say, when it comes down to it, this is really my absolute favorite online tool for my classroom!!!! The ability to visually bookmark resources and links, then divide the links up into multiple different sections has been a God send in my classroom and sanity! What I have done is create a separate Pinterest account specifically for use with my classroom and everything is related to education. I have separate boards for different units and software, then I am also able to create boards with extra information about other topics related to our content, but not directly written into the curriculum. Several of my students know I am also a photographer, so they ask for my advise with photography, so I developed a board where I could share useful links of information I found regarding photography. Now, the students can explore my suggestions on their own time, and develop their knowledge on their own terms. This resource has allowed me to share information so much more efficiently with my students, and a few have requested invitations for themselves and are beginning to visually bookmark themselves, and they are exploring my provided materials more frequently because it is visually appealing! 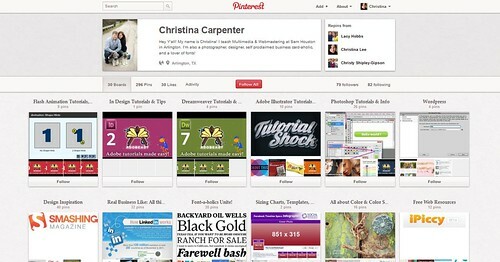 For a more in-depth look at how I use Pinterest, check out a blog post I recently did. The next two tools are pretty well known, but are beginning to just now take off in my district, Quizlet and QR Codes. Quizlet is an amazing online flashcard resource that really is an all in one sort of site for vocabulary words or concepts. Words and definitions are entered once, then they can be used for interactive flip flash cards, matching games, quizzing, discussion, etc. Sound buttons will also allow English Language Learners to hear how words are spoken and pronounced as well as assist with the visually impaired. One thing I also love is that the flashcards and games can be embedded on a separate web page. So if I would like the cards to show up on my class web page, all I have to do is copy the code and enter it in the appropriate spot! Another great feature of Quizlet is the ability to search available flashcard sets; there are plenty to choose from for preparing for a multitude of standardized tests, such as ACT/SAT, LSAT, PSAT, AP, etc; so it’s great for those students who are preparing to apply for college soon. QR Codes have actually been around for a while, they are just now becoming popular in the mainstream US population over the last two years. QR codes serve as a link that can be available to mobile devices straight from a screen or more importantly, print and physical media. Increase Parental Involvement: On the contact cards I make for Open House each year, I am making a QR code for our school and class websites, allowing parents to easily access our online material. I have even considered having magnets made so they will be able to be placed on the refrigerator at home and have less chance of being lost. Increase student communication and utilization: On handouts I provide at the beginning of the school year, I am creating a QR code for my Gmail address for my students as well as one for our class website. If students have the ability to immediately download my email address to their phone, I believe they are more likely to utilize it and communicate with me throughout the year if they have questions or problems. Create an interactive classroom environment without student computers: QR codes allow a teacher to develop a more engaging classroom environment without having to have the use of a lab. If a school allows the use of smart phone and tablet technology, QR codes can be placed under pictures or on various labels throughout the classroom, then students will have the ability to scan the code using the reader on their own device and view the corresponding web page, video, or information that links to the information in the room. At this point, the scanning can be done through an activity or through student choice, and it is my firm belief that when a student chooses to access a resource, they are much more likely to be engaged and retain information they learn from the information they discover by choice. As I realize that the Adobe Creative Suite can be extremely expensive to purchase, I make sure to share resources I find with my students that are free of use that are similar in purpose that can be found online. These resources have proven to be of great use to students and educators alike! While I could go on and on regarding the web resources I like to use in my classroom, the above mentioned ones are resources I use on a daily or regular basis. Listed below are some of the other resources I use in my classes as well.